Pathology is the study of disease, especially of the structural abnormalities produced by disease. The word pathology comes from the Greek words pathos, meaning “suffering”, and –logia, “the study of”. In addition to describing the study of disease, the word pathology can also be used to describe characteristics of a disease itself (e.g. “the pathology of cancer”). The three broad subtypes of pathology are anatomical pathology, clinical pathology, and molecular pathology. Pathology has a history dating back to ancient times. The ancient Egyptians are one of the earliest known cultures to document disease and its effects on organs of the body. Ancient scrolls of papyrus contain information on bone injuries, parasites, and lumps that may have been cancer, among other diseases. Later on, starting in the 5th Century BC, the Greek physician Hippocrates had a profound influence on medicine and pathology. Many ancient Greek writers who were inspired by Hippocrates recorded detailed information on wounds, tumors, and diseases such as tuberculosis. Additionally, animal dissection began to be practiced. Hippocratic ideas then spread to Rome. During the Middle Ages, scientific progress slowed overall, but Byzantine and Arab physicians also made contributions to the study of disease. The biggest revolution in pathology was the emergence of the microscope in the 19th Century. Now, for the first time, cells could be studied in detail. The focus of understanding disease changed from studying entire organs to focusing on individual cells. 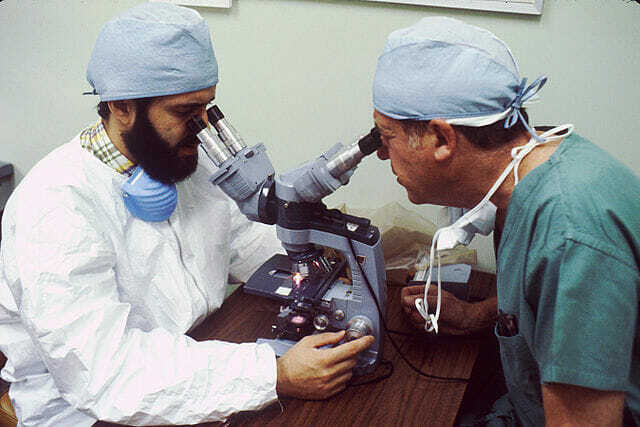 With the development and increased availability of microscopes, pathology research increased exponentially and led to huge scientific advancements such as organ and tissue transplants. This image from the National Cancer Institute shows a pathologist and a surgeon examining cells under a microscope. There are three main subtypes of pathology: anatomical pathology, clinical pathology, and molecular pathology. These subtypes can be broken down into even more specific categories; pathology is a diverse field because so many different diseases and ways of studying diseases exist. Surgical pathology is the examination of tissues removed during surgery. A common example is the examination of a small piece of tumor tissue to determine whether the tumor is malignant (cancerous) or benign and make a diagnosis. This procedure is called a biopsy. Histopathology is the examination of cells under a microscope that have been stained with dye to make them visible or easier to see. Often, antibodies are used to label different parts of the cells with different colors of dye or fluorescence. After the microscope became widespread in pathology, many different methods of preserving and dyeing tissue were developed. Cytopathology is the study of small groups of cells shed in bodily fluids or obtained through scraping, such as those taken during a cervical Pap smear. A Pap smear detects cervical cancer and some types of infections. The cells are taken by swabbing the cervix, and are then processed and examined under a microscope to check for abnormalities. Chemical pathology, or clinical chemistry, involves the chemical analysis of bodily fluids, through testing and microscopy. Commonly, chemical pathology involves the study of blood and its immune components like white blood cells. Hematology is also related to the study of blood, but it has more to do with identifying blood diseases specifically than chemical pathology does. Hematologists also study the lymph system and bone marrow, which are other parts of the hematopoietic system. Immunology, or immunopathology, is the study of immune system disorders. It deals with immune responses to foreign molecules, allergies, immunodeficiencies, and organ transplant rejection. Molecular pathology is the study of abnormalities of tissues and cells at the molecular level. It is a broad category that is used to refer to the study of disease of any organ or tissue in the body by examining what molecules are present in cells. It can combine aspects of both anatomical and clinical pathology. Some techniques that can be used in molecular pathology include polymerase chain reaction (PCR) to amplify DNA, fluorescence labeling, karyotype imaging of chromosomes, and DNA microarrays (small samples of DNA placed onto biochips). Pathologists are medical doctors; to be a pathologist, one needs to go to school for a medical degree and complete residency. Only MDs can truly be described as pathologists. However, many different careers exist in the field of pathology, for those with various levels of education. With a high school degree and subsequent specialized training, one can become a phlebotomist, a person who draws blood from patients for training. With a two-year associate’s degree, one can become a laboratory technician. Laboratory technicians perform laboratory testing, often under supervision. A person with a bachelor’s degree, often in biology or biochemistry, can become a research laboratory technologist or a clinical/medical laboratory technologist. In this position, one can assist in performing research and clinical testing. Those who go on to get a Master’s degree can become a laboratory manager or pathologist’s assistant. Those who go even further to get a Ph.D. can become a research laboratory scientist, where they will design experiments involving pathology in order to expand upon scientific knowledge and help doctors better treat disease. n.a. (2016-04-13). “Anatomic Pathology.” Lab Tests Online. Retrieved 2017-04-15 from https://labtestsonline.org/understanding/features/anatomic-pathology/. n.a. (2017). “Careers in Pathology and Laboratory Medicine.” University of Rochester Medical Center. Retrieved 2017-04-15 from https://www.urmc.rochester.edu/pathology-labs/about-us/pathology-careers.aspx. Mandal, Ananya. (2013-11-07). “Types of Pathology.” News-Medical.net. Retrieved 2017-04-15 from http://www.news-medical.net/health/Types-of-Pathology.aspx. Netto, George. J., Saad, Rana D., and Dysert, Peter A., II. (2003). “Diagnostic molecular pathology: current techniques and clinical applications, part I.” Proc. (Bayl. Univ. Med. Cent.) 16(4): 379–383. “Pathology.” Merriam-Webster.com. Retrieved 2017-04-14 from https://www.merriam-webster.com/dictionary/pathology. Van den Tweel, Jan G., and Taylor, Clive R. (2010). “A brief history of pathology.” Virchows Arch. 457(1): 3–10.